Often times fire hearths or fireplaces become redundant when homeowners no longer use them for fires. In other cases, fire hearths and fireplaces become eyesores or are not part of a new homeowner’s vision. Whether you want to remodel your fireplace or remove it to provide extra floor space in a room, GJP Floor Sanding Surrey professionals can help you with your fire hearth removal. 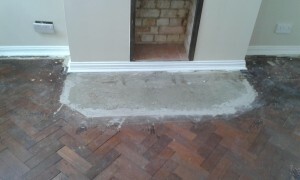 GJP Floor Sanding Surrey are specialists in removing concrete fire hearths. We never cut corners, and we take care when removing the hearth to ensure adjacent floorboards are not damaged during the process. Just like our high-quality floor sanding and restoration services, we bring excellent attention to detail and professional workmanship to our hearth removal process. We start by chasing out the concrete hearth before we lift the floorboards surrounding the old hearth or fireplace. Excess concrete is removed by our staff, who will screw joists into place where needed to bridge any gaps and to provide support for new floorboards. After we prepare the site, we venture out to reclamation yards to search for high-quality, reclaimed floorboards until we find the right match for your floor. Reclaimed pine floorboards are used to cover the void where the hearth was once located. We also stagger the floorboards to ensure they blend in with the existing floor. Once the hearth is removed, new floorboards are fitted into place, and gaps are filled, we apply our sanding and professional finishing process to the floor. During the finishing process, our experienced staff will blend in a new piece of skirting to ensure an invisible, superior repair. We complete the repair by applying a final coat of lacquer. 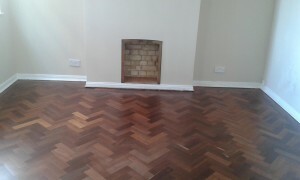 The end product is a seamless new floor with no trace of the fire hearth. We leave the room as if there had never been a hearth or fireplace, leaving you with a blank canvas to create your ideal room. Remember, if you are remodelling a room and you plan to remove a fire hearth or fireplace, call us first. Our dedicated staff can help you plan and stagger your remodelling. It is best to remove the fire hearth before you begin other work on the room, including painting and decorating. You should also complete any work where access beneath the floor is required, such as electrical or plumbing work, before we remove the hearth and refinish your floors.